Your membership donation will help the Sanford Historic Trust achieve its mission for years to come. Please accept our heartfelt thanks for your generosity and commitment to the Sanford Historic Trust. Please tell your friends and neighbors about the Trust and encourage them to join today! The Sanford Historic Trust is a registered 501(c)(3) non-profit corporation (EIN# 59-2978621). In accordance with regulations established by the Internal Revenue Service no goods or services are provided in consideration for these donations. Individual (without Automatic recurring payments) - $30.00 (USD) Subscription period: 1 year, on: January 1st No automatically recurring payments Active members shall be those persons, at least eighteen years of age, who have paid the annual dues. Each person who has paid the annual dues shall have one vote. Organization (without Automatic recurring payments) - $30.00 (USD) Subscription period: 1 year, on: January 1st No automatically recurring payments Organization members shall be those organizations/agencies/businesses who have paid the organization dues. Each organization/agency/business shall have one vote, regardless of the number of their members that attend a Trust meeting. Members of an organization/agency/business who have paid individual member dues do not lose their vote solely because of membership in an organization/agency/business. No person shall have two votes-one as an individual member and another as a representative of an organization/agency/business. Student (Full Time College) - $10.00 (USD) Subscription period: 1 year, on: January 1st No automatically recurring payments The student membership option is available to full time college students. Proof of active student status may be requested for validation. Each person who has paid the annual dues shall have one vote. If you are unable to join online pleaes click the image below. 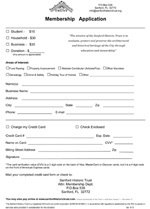 This form is not required if you signed up online.